At least 5,000 people turned up at the funeral of the prominent theologian Muhammadrafik Kamalov killed in a joint Kyrgyz-Uzbek counter-terrorism operation on August 6. The service for the dead began at Kamalov's home in Qorasuv, a city in the southern part of Kyrgyzstan, at 7 p.m. on August 7. Moslem traditions require that before the body is interred, everyone present with the imam leading read the last prayer for the dead - janoz namaz. A rally preceded the janoza namaz. Speakers at the rally proclaimed Kamalov "a victim of the state terror" and a "shakhid" i.e. an innocently murdered servant of Allah. "The Shar'ah law treats an individual who does not speak the truth as a fallen and morally stricken man. Allah be praised that Muhammadrafik-kori always spoke the truth. He is a shakhid! Let us congratulate him on having become one in the name of Allah through speaking the truth," one of the speakers at the rally said. Mufty Muratala aji Jumanov, Chairman of the Kyrgyz Religious Administration who also addressed the rally, called for tolerance. "Moslems are tolerant, and this is what distinguishes them. Allah alone knows who will die and how. We must accept this death in a worthy manner, and all others must accept it for this is Allah's will," the mufty said. Young men lifted Kamalov's body and carried it down the streets of Qorasuv for two hours, chanting Allahu Akbar, La Ilaha Ilallah, and Shakhid Muborak! (Hail the Shakhid!). More and more people joined the procession. Numbering about 2,000 people at first, it swelled to between 4,000 and 5,000. The procession marched in front of the prosecutor's office, court, mayor's office, and police department. Not one officer of law enforcement agencies was encountered. Even sentries usually guarding the building of the police force prudently disappeared, this correspondent saw. The march was entirely peaceful, without any clashes with the police or locals. Elderly men and women wept. Some women were heard telling their teenage sons to join the procession. "Walk in front of it and shout "Shakhid Muborak!" and "Allahu Akbar!" as is your duty," they said. ... A press conference was taking place in the meantime at the Osh office of the National Security Service. Its Chief Bakyt Bekibayev briefed journalists on the operation run the previous evening together with the Uzbek National Security Service. "Two gunmen identified as terrorists of the Islamic Movement of Uzbekistan were killed in the operation. Here, you can see the photo of one of them. He was identified as Ajubhoji Shakhobiddinov also known as Sheikh, Mashrab, and Umar. The other gunman was identified as Fathullo Rustamovich Rahimov a.k.a. Abdullo. These men were wanted by the authorities of Tajikistan and Uzbekistan for several terrorist acts. 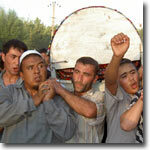 They had murdered eight policemen in the Sogdi region of Tajikistan. Kamalov was the third in the auto. It was a white Nexia, and the car belonged to Kamalov," Bekibayev said. According to Bekibayev, the Nexia was encountered and signalled to pull over in Osh environs. "Ordered to pull over, men inside the Nexia opened up. They had a Kalashnikov assault rifle," Bekibayev said. "Servicemen of the National Security Service returned fire. Three men in the Nexia were killed." 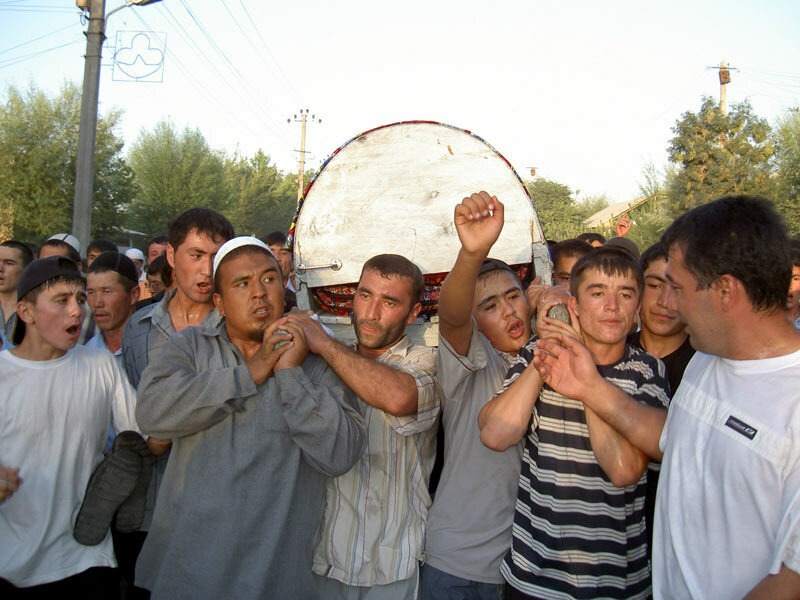 Residents of Qorasuv demand from the authorities more by way of explanations. Some people this correspondent approached believe that Kyrgyz and Uzbek secret services had orders to kill the theologian who had been sharply critical of the authorities and their repressive policy. The faithful who attended the mosque where Kamalov was the imam have their own hypotheses. "We all know that Muhammadrafik-kori was at odds with the authorities. He never tried to adapt sermons and prayers to the needs of the state policy and always spoke the truth. They murdered him for that," a young man by name of Ajubhon said. Kamalov had been the imam of the mosque in Qorasuv for over twenty years. Up to 5,000 faithful came to pray at the mosque on holidays. The late imam's family denies his involvement with terrorist organizations. Ajub Mashrabov of the Kyrgyz Hizb-ut-Takhrir confirms it too. "The imam was not a member of Hizb-ut-Takhrir," Mashrabov said. "He preached the Shar'ah law. Not everyone who lives by the Shar'ah law is a member of Hizb-ut-Takhrir. We regarded him as a Moslem brother, nothing more."